I earned my doctoral degree in computer science from The University of Texas at El Paso in 2015 and since then have published over 20 research papers focused on virtual agents, gaming, virtual reality, and human-computer interaction. 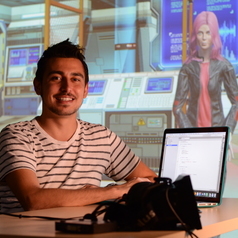 In 2013 I co-founded Inmerssion, where we build and research innovative ways virtual agents (computer-generated characters with artificial intelligence) and virtual, augmented, and mixed reality (VR, AR, MR) applications can help educate and entertain through engaging storytelling. In late 2017 I was appointed as the CTO for Beacon Hill VR, where I lead the technical effort to develop VR and AR industrial solutions for simulation, training, manufacturing, logistics, and quality assurance. My team’s research and interactive software has been showcased in dozens of research conferences across the world, and we have collaborated with companies like IBM to create artificially intelligent virtual people, or ZF/TRW to create training software in virtual reality. I also like giving back to the scientific and education community. During the past 10 years I have given over 350 outreach presentations, talks, workshops, and demonstrations to encourage young minds and seed their interest in STEM related fields.